When deciding on the Best drill press it’s important to consider a wide range of factors. We review several excellent drill presses and provide insight on what to consider when buying a drill press. I learned a long time ago that drilling into steel with a hand drill is not the best way to go about things. The drill bit can easily jam, causing the drill itself to turn instead of the bit. If this has ever happened to you, you’ll know what I’m talking about. It feels as though someone has tried to twist your arm off. Using a drill press is the best way to avoid this from happening. A drill press is a handy addition to any workshop, be it a small home shop or a professional shop. It’s especially useful for drilling larger holes in steel. The drill speed can be set correctly, and you can apply more pressure when drilling. This combination enables you to drill holes of the correct size and they’ll always be perfectly round. When using a hand drill, even the slightest movement will cause the hole to elongate and increase its size. Another advantage of a drill press is that it can repeatedly drill holes to the desired depth with perfect accuracy. Making it an ideal tool to use with attachments to make Mortise and Tenon joints. Mortise and Tenon joints are used to join pieces of wood that connect at a 90° angle. In its basic form, it is both simple and strong. When using a drill press, the joints are rounded but are just as strong as squared-off mortises and tenons. Pocket-screw joinery is another way of joining wood. It involves drilling angled holes into one workpiece and joining it to a second workpiece with self-tapping screws. The drill table can be swiveled and locked at any angle up to 45° (90° on some), enabling you to drill angled holes accurately. You’ll need a pocket-hole attachment to do pocket-hole joinery using a drill press. Attachments are available that change the machine into a vertical grinder, so you can slide the piece on the table against the grinder for a perfect finish. Similarly, you can buff the work with an attachment and the machine can be used as a spindle sander. The first drill press that we’ll be reviewing is used for special drilling tasks. I consider it to be the best magnetic drill press. The magnetic drill press is an interesting drill that’s built for construction work. In the next section, which is the drill press reviews, we’ll start by discussing the DEWALT DWE1622K 2” 10 amp. Following that, I’ll review the two best benchtop drill presses: the WEN 4208 8”, 2.4 amp drill press and the SKIL 3320-01 10”, 3.2 amp drill press. The final one is my personal favorite. I consider it to be the best drill press for my needs. It’s a floor-standing unit: Delta 18-900L 18”, 5.8 amp laser drill press. Following the reviews, I’ll advise on how to select the best drill press for your needs. You will also find some great tips and a discussion on specialized drill presses. Magnetic drill presses are also known as a mag drill, portable base drills, or a portable drill press. A magnetic drill press is the best portable power tool used for drilling holes in steel and magnetic metals like structural steel. The base of the machine is a strong magnet (either an electromagnetic or a permanent magnet) that clamps to the workpiece. It uses annular cutters, milling cutters, and other rotary cutters to drill large holes. By fitting a chuck adapter, it can be used with standard twist drill bits for drilling smaller holes. Exceptional drill press for professionals. We selected the DEWALT DWE1622K because it’s one of the best magnetic drill presses. Mag drills are great for use in structural steel construction – for drilling holes 1/2″ and upwards into beams and connection plates. This machine attaches to metals with its big magnet. It is, therefore, a special type of machine that is used to drill holes through the steel that it’s clamped to. Keep in mind though that the steel must be thick and large enough to seat the magnetic base. When you look at the specs for this machine, the most notable is its 10 Amp motor and two-speed direct drive gearbox. That’s a lot more power than you’ll find on most drill presses. 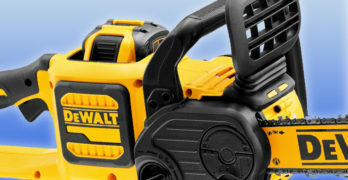 The DEWALT DWE1622K is designed to drill large holes (up to 2”) into steel (up to 4” in thickness). Its magnetic base makes it possible to drill the holes where you need it, be it vertically or overhead. 4″ Drill travel offers maximum capacity for heavy duty applications. Straight shank drill bits are the twisted drill bits with a straight shank for drilling into steel. There is no taper and it is meant to be used with a chuck. We’ll discuss drill bits, shanks and chucks in more detail later for those who are not too familiar with these tools. Like any normal drill press, you use feed handles to lower and feed the drill bit. A nice feature on this machine is that the feed handles can be hand screwed to either side of the drill. It’s great when drilling in awkward positions where the feed handles can get in the way. It also makes it easy for left-handed people to use the machine. Supplied with the machine is a magnetic tank for feeding cooling fluid onto the cutting bit. When filled with quality cutting fluid, it also lubricates the bit while cooling it. A good cutting fluid greatly extends the cutting tool life, saving you money. You’re also able to regulate the flow of the cooling fluid. The cutting fluid tank attaches to the workpiece or the drill press magnetically. It can be placed on either side of the tool or on a work surface, allowing for a variety of tool orientations. The fluid is applied directly to the cutting edge of the tool, eliminating unnecessary wastage. You should not use liquid cutting fluids while drilling into vertical surfaces or overhead. When drilling vertically, the fluid is going run down the surface and using it overhead – well, you’re going to get a face covered in cooling fluid. No fun at all. Rather dip the cutter into a cutting paste or apply an appropriate spray for these applications. The drill has a 4″ drill travel, enabling you to drill through 4” steel. You’re able to adjust the distance between the gearbox and the material that you’re drilling into. This means that you can raise the motor, perfect when using longer tool bits because you still get the full drill travel. With a shorter tool, the head is lowered so that it can still drill to its maximum depth. Supplied with the DWE1622 drill press is the all-important safety chain that attaches the drill to the workpiece. This is an important accessory for your own safety. It holds the drill press when power is lost and the magnetic base loses its hold, preventing it from falling – even when the base simply loses grip. It will also stop the machine from spinning around on its own momentum. The steel surface has to be flat and reasonably clean, otherwise, the magnet will not get a 100% hold on the steel. The magnetic base needs the steel to be a minimum of 1/4″ thick and more is better. This drill is normally used with annular type cutters and, therefore, drills larger holes very fast. An annular cutter is basically an end mill with a hollow center for drilling big holes. It clicks into the Weldon Shank chuck for a secure fit that will handle the torque. The magnet is extremely powerful. People who wear pacemakers, defibrillators, etc. should not use this drill. Drill up to a 1/2-inch hole in heavy-duty cast iron. The WEN 4208 has an 8” swing and 5-speeds, making it the smallest bench-mounted drill press in this review. 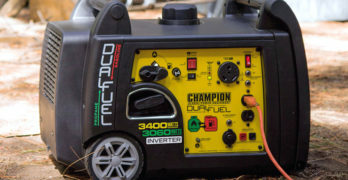 It’s a great size for a garage or home workshop and the 1/3 HP induction motor is powerful enough to easily drill through most materials like metal, wood, plastic or just about any material that you might think of. The slowest speed of 740 RPM will enable you to drill steel with an HSS bit of up to 7/16” (11mm) in diameter. 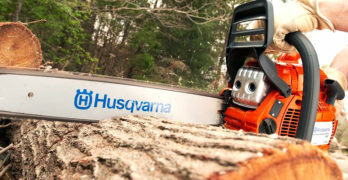 It will power through wood, plastic, and aluminum without a problem. The 1/2 in. chuck will easily hold the 7/16” drill bit. Should you find that the bit slips in the chuck, you can purchase bits that directly fit the machine shank. The 2” spindle travel means this drill press sinks holes up to 2” deep. It’s a great drill press for 2X4s and steel plate. The swing depth or swing of a drill press confuses many buyers. It’s a term derived from the lathe machine. The swing depth refers to the largest workpiece that can swing from the lathe chuck and clear the machine. The swing distance is, therefore, the outside circle created by the swing of the workpiece. The swing size of a drill press is double the throat depth of the drill press. The throat depth being the distance from the chuck centerline to the vertical column. This measurement is used to describe the size of the drill. So the WEN 4208 8” drill press, therefore, has an 8” swing depth. By dividing this depth by 2, you end up with a throat size of 4”. I find it easier to remember that an 8” unit can drill the center of an 8” piece of round material. The rigid base and frame, manufactured from cast iron, makes the machine stiff and so enables accurate drilling. The 1/2“ keyed chuck that is supplied with the machine has a JT33 spindle taper. It’s easily swapped with a JT33 taper tool or even a bigger chuck. For angled drilling the worktable bevels 45° left and right. I would prefer a 90° bevel but 45° is normal for most drill presses. The base contains pre-drilled holes, making it easy to mount the drill press onto a bench or work stand. The drill table is slotted, so it’s easy to mount clamps and vices. I would definitely recommend buying a good drill vice with the machine. This makes it safer to drill a workpiece that’s held in a chuck and you can work more accurately when your workpiece is properly secured. It is convenient too; clamping your workpiece is quick and secure. X2 2-Beam Laser helps ensure precise hole alignment. I feel that the SKIL 3320-01 is the best benchtop drill press in this review. Slightly bigger than the WEN 4208, the SKIL is a solid choice. It has a 10” swing, enabling it to drill into the center of a 10” workpiece. At 52.2 pounds, it’s a lot heavier than the WEN, which is 35lb. It’s only 21.8” tall (the WEN is 23”), so it’s sturdier than the WEN. Like the WEN, it’s a 5-speed machine and the slowest speed you can select is 570 RPM. The 1/2HP motor is stronger than the WEN motor, so it will easily drill a 5/8” (15.87mm) hole into steel. A nice feature on the SKIL 3320-01 drill press is the adjustable depth stop, allowing you to drill holes to a predetermined depth. Very useful when doing mortises and tenons. The tilting work surface can only tilt 45° left and right but at least it’s convenient and quick. SKIL also include an X2 two-beam laser that makes a clearly visible cross on the workpiece. Unfortunately, it uses batteries, but they should last for a long time. It makes accurate drill alignment a lot easier because you can effortlessly align the cross with your punch or pencil mark on the workpiece. Benchtop drill presses are meant to be mounted on a bench top. It can also be clamped on a bench top when used and easily stored away when not in use. I recommend that the drill press should be securely fastened through the mounting holes to a stand or workbench with heavy-duty fasteners. This will prevent the drill press from tipping over, sliding, or walking during operation. For most casual users, benchtop drill presses are the best type of drill press to use. It’s a useful machine for completing numerous tasks at home. The SKIL drill press is very affordable and it’s a good all-rounder for most construction and building jobs. Excellent professional quality drill press. Auto-Tensioning Belt Drive System allows for fast and easy speed changes. Full 6 in. Quill Stroke for deeper drilling applications and Best-In-Class capacity. The floor-standing Delta 18-900L drill press is the heaviest, tallest, strongest and most flexible of the drill presses we review here. I wish I had one. It’s my all-out favorite. The Delta 18-900L stands 59” tall and weighs in at 261 pounds. It has an 18” swing so you can drill into the center of an 18” workpiece. Powered by a 3/4-horsepower induction motor, this drill press has enough power to handle any job. On top of that, it has a quill stroke of 6” for really deep drilling and mortising. The Delta has a much bigger worktable than the benchtop models. It’s also the most flexible worktable arrangement of the three drill presses. With the rack-and-pinion height adjustment, it’s easily raised and lowered to the desired height. It can tilt back to front from zero (0) to 45° and right or left from zero (0) to 90°. As can be expected, the worktable has T-slots for clamping and fixing ca drill-vice. An insert made of MDF (Medium-density fiberboard) is installed in the center of the table, preventing wear and tear on the bit when it drills down through the workpiece and it’s easy to replace. The Delta 18-900L offers a wide range of sixteen spindle speeds from 170 to 3000 RPM – making it easy to select the best speed for any drill operation. Adjusting the speed is quite complex, using three pulleys. Fortunately, a belt-positioning speed chart is located on the inside top cover of the drill press, making things much easier. The chart not only shows belt arrangements, it also recommends the RPM for most materials and bit sizes. To make speed changes easier, it has an auto-tensioning belt drive system. A belt tension lever handle is used to release and hold the tensioner arm while you change the belts. On steel, it is sometimes difficult to see positioning marks. Fortunately, the Delta 18-900L drill press is fitted with an LED work light with a switch. You can adjust the light to a position where the marks stand out clearly. As with the SKIL drill press, the crosshair lasers make it a lot simpler to align drill marks to the drill. I like that the Delta’s laser uses AC power and doesn’t require batteries. A “LASER” button turns the crosshair lasers on or off. The machine takes a #2 Morris taper – you can use practically any type of tool with it. Swapping tools is easy and using the chuck that’s provided, straight shank drills can also be used. It’s often said that: “Different drilling conditions make it impossible to develop any rigid rules for feeds and speeds”. Having a wide range of speeds makes it easier to select the correct speed for the material that you’re drilling. It’s a known fact that various metals machine best at certain speeds. The best speed for any given metal is referred to as its cutting speed (CS). This is the speed in linear feet per minute or “Surface Feet per Minute” (SFM) that a given tooth (flute) on the cutter will be moving when it cuts through the material. All materials have a documented SFM or cutting speed. If you know the cutting speed of a material, you can use a simple formula to find the best RPM for the twist drill: RPM = (3.8197 / drill diameter) x SFM. Most drill presses will handle all types of wood, aluminum, brass, ordinary bronze, magnesium and its alloys, as well as plastics or similar materials. Steels and stainless steel need a drill press that has a slow speed of at least 30 SFM or 229 RPM for a ½” drill bit. I do a lot of drilling in steel and prefer a drill press that has a slowest speed of around 170 RPM. Drilling in metal causes swarf or chips (with soft metals such as brass), or shavings (with hard metals such as iron and steel). Special drill bits are available for both these types of metal. The cutting edges of drill bits for soft metals are flat to ensure that these drill bits don’t ‘bite’ into the metal so easily. These bits work well with other soft materials such as wood, plastic, and nylon. The cutting edges of drill bits for hard metals are sharp. Too much feed into steel will cause the drill to split or chip. Too little feed will cause chatter and dull the drill and will also harden the workpiece, making it difficult to drill. A good sign that you’re using the right speed is that you’ll get nice long shavings. Stainless steel can easily work harden. Meaning that the material can harden up to the point that it becomes almost impossible to continue. It happens when you let off your feed pressure and allow heat to build up through loss of ‘byte’. Use solid steady feed pressure, plenty of coolants, the correct speed (130-150 RPM) and DO NOT let up. Not even to adjust your position, plan ahead. To select the best drill press for your needs, you have to consider a few factors. First, we have to consider the type of machine: benchtop or floor standing. If you want more power, choose a floor-standing model. Keep in mind that a floor model takes up some floor space. You’ll need enough space to mount the drill press, allowing you to move around it easily. It’s the type of machine used by professionals and can handle larger workpieces than a benchtop drill press. Manufacturers of floor models offer more accessories and attachments. Floor models can also drill through thicker materials and make bigger holes. They have a swing from 13 to 20 inches and a stroke from 3 to 10 inches. They also offer a wider speed range and the slowest speeds are fit for drilling large holes into any steel. Another obvious consideration is the type of chuck supplied with the machine and the type of shank used. Two types of arbor are in use: machine arbors and chuck arbors. The chuck arbor fits into the machine arbor so it’s easy to replace with another tool. Drill presses can be used with special drill bits that do not fit into a chuck but to the machine arbor. It’s what makes these drills so versatile. Chucks are for using straight shank drills and accessories. The most commonly used chucks have three jaws, (sometimes called dogs). Some special chucks are available with more jaws to improve their clamping power. You normally tighten or loosen the chuck with a chuck key. Keyless designs conveniently make chucking and un-chucking easier but have lower gripping forces than the keyed chucks. It often happens that a drill bit will work loose in a keyless chuck. Because of the flexibility that the drill press offers, it is wise to have a keyless chuck around for those quick-change needs, only using the keyed chuck when you need a better grip. When drilling larger holes it’s better to use annular cutters, milling cutters, and other rotary cutters. They fit the machine arbor to avoid slipping, which can be a problem even when using keyed chucks. The quill is the sleeve of a drill press into which the spindle mounts. On the vertically mounted drill press, the quill moves up and down when the operator feeds the drill bit. The head of the drill press is stationary and only transmits the power to the quill. The distance the quill can travel determines the depth of stroke – how deep you can drill. If you often drill 2X4s, a 4” stroke is required. A 2″ quill stroke may sound like a limitation but in reality, it’s not a big deal. Though for woodworking, 2” can be limiting. Generally, most people don’t need more than a 2” quill stroke. The radial drill press or radial arm press differs in that the drill head is mounted on an arm assembly that can be swiveled around a 360° radius and the swing can be changed. The arm together with the head, drive-assembly, and motor, all move as one unit and can be tilted away from the normal 90° upright position. This arm assembly is mounted to a normal column with a worktable that can be tilted. The working end extends to over twice the swing capabilities of standard drill presses. It’s more robust and built for heavier duty, more specialized work than the drill presses that we reviewed here. If you need more reach and versatility than the floor mounted drill press can offer, consider a radial drill press. Keep your fingers well out of the drill area and use safety gloves. Please use safety glasses. The drill is close to your eyes and everyday eyeglasses are NOT safety glasses. Use an appropriate cutting fluid for drilling steel, it lubricates the cutting edges and extends tool life dramatically. I glued a strong magnet to a plastic bottle and attached a feeder pipe to the bottle. A small stopcock regulates the flow. When drilling, I attach it to the side of the drill to feed coolant to the tip. Securely clamp down all metal workpieces. Any tilting, twisting, or shifting causes a rough drill hole and increases the potential for breaking a drill bit. When drilling wood, Brad point bits are preferred. Soft metal twist bits are fine but not auger bits. They turn so rapidly that they lift the workpiece off the table and whirl it around. Always try to use scrap wood as a backing or a base block under the workpiece. It will reduce splintering and protect the point of the bit when you drill through the piece. Here’s the best tip for countersinking holes drilled into wood or steel! Mark your workpiece as usual, but before you drill the holes, set the drill press for the countersinking depth. Then proceed to drill the countersink holes first. The finish will be perfectly smooth and to the correct depth. Next, drill the holes, the drill bit will seat inside the countersink and make it easy to drill accurately. You’ll never drill the holes first, ever again!